The following sales terms' object is to, on the one hand, inform all potential customer. In consequence, any person ordering a product shown for sale of the website www.teojasmin.com acknowledges full and complete acception of these sales terms, and having read them prior to placing the order. the purchase of products on www.teojasmin.com has no link whatsoever to his professional activity and is limited to a strictly personal use. he has complete legal capacity to vouch for his responsibility regarding these sales terms. The Téo Jasmin company reserves the right to modify these sales terms at any moment. It is the buyer's personal business to set up the technical and communication related means to access the www.teojasmin.com website. All costs related to the access to and use of the website through telecommunications remain at the buyer's expense. Sale prices for products shown online on www.teojasmin.com are in euros and are those applicable at the time of the registering of the buyer's order form. They do not include shipping costs, invoiced as a supplement upon the price of the purchased products depending on the amount of the order. Shipping costs will be shown before the buyer registers his order. Prices include the VAT that is applicable on the day of the order and all changes of the applicable rate of the VAT will be automatically reflected on the prices of the products sold by Téo Jasmin on their website. Products prices can be modified by www.teojasmin.com at any moment. The buyer will be informed of such modifications prior to all orders. According to article L 111-1 of the Code de la Consommation, the buyer can, prior to his order, get access to the main characteristics of the product(s) he wishes to order. The buyer selects one or several products among the different categories offered on the www.teojasmin.com website. Special offers presented on www.teojasmin.com are valid until stocks run out. Téo Jasmin reserves the right to modify the assortment of products depending on suppliers constraints. Photographs, graphic designs and descriptions for all products on sale are only an indication and cannot commit the seller in any way. In the event of a modification of a product by a supplier, the graphic representation of the product will not involve the seller's responsibility or affect the validity of the sale. All order implies the unreserved and unequivocal acknowledgement of these sales terms. From the moment the buyer has registered his order by clicking on the "settle your order" button, it is considered he has willingly and without reserve accepted these sales terms, prices, volumes and quantities of the products on sale and ordered. The buyer can order online on the www.teojasmin.com website. The buyer's order will be confirmed by Téo Jasmin via e-mail. The sale will only be considered as definite after the buyer has received the confirmation by e-mail and full payment has been received in exchange. It is Téo Jasmin's recommandation for the buyer to keep all information related to the order on printed paper or computer files. Full payment must be processed during the placement of the order by the buyer. All paid sums can never be considered as advances or deposits. 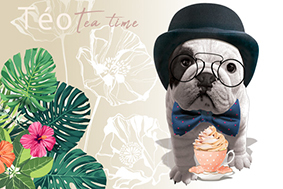 The collection of the full amount of the order will be processed by Téo Jasmin upon confirmation of the order or in the event of payment by check upon receiving it. All orders are to be paid in euros. To settle his order, the buyer can use any of the means of payment indicated within the order form : credit card (CC, Mastercard or Visa), or bank transfer. The buyer guarantees to Téo Jasmin that he holds the necessary authorizations to use the means of payment he has chosen during the registering of the order form. Téo Jasmin reserves the right to suspend or cancel any order and /or delivery, of any nature or level of execution, in the event of a default of payment of any sum owed by the buyer, and in case of an incident of payment. Penalties for an amount equal to the legal interest rate plus five points are applicable to the unpaid amounts following a ten days deadline after the invoice date or immediately following the notification by the bank of rejection of any other means of payment. The delivery of all consequent orders can be suspended in the event of a payment delay for a former order, notwithstanding the previous dispositions. Téo Jasmin reserves the right to request a copy of the buyer's ID document for all purchases made by credit card. To fight against internet fraud, information regarding your order can be transmitted to a third party for verification. 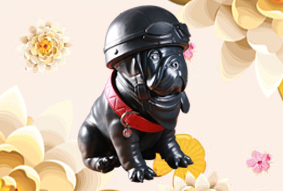 After having reviewed the products sold by Téo Jasmin and their characteristics, the buyer has responsibly and under his own guidance according to needs previously established before placing his order, chosen the products for his order. The products will be delivered to the address given by the buyer on his order form. The buyer can, upon demand, receive a copy of his invoice at the billing address, and not the delivery address, by indicating so in the appropriate field on his order form. In the event of a partial availibility of the products, www.teojasmin.com can proceed to a division of the orders. The available articles will be sent ahead, with the remaining articles being sent when they become available again. Téo Jasmin offers delivery services by la Poste, TNT et GLS. Unless all the procedures listed below have been followed, no complaint from the buyer will be acceptable. The buyer is delivered at his home by a delivery man from La Poste. If absent, the buyer or the consignee receives a depot card from the delivery man, which enables him to contact La Poste to arrange for another delivery in his presence. - follow La Poste's procedure (signal the damages as well as any complaint and reserve) and refuse to accept the merchandise by emitting on the spot a report of anomaly with La Poste. - signal the incident to Téo Jasmin. The average delivery deadlines from the www.teojasmin.com warehouse are from 1 to 7 days depending on the selected products. This deadline is given as information. Any longer deadline will not be cause for damages, withholding or cancellation by the buyer. In any case and according to article 2014-344 from March 17, 2014 from the Code de la Consommation, the ordered products will be delivered within a deadline of thirty days maximum from the day following the registering of the order, provided full payment has been made. If the delivery has not happened upon expiry of the deadline, the buyer will be able to cancel his order. All sums paid by the buyer will then be returned under a 14 days maximum deadline, excluding all other compensation. 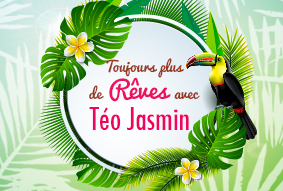 If the delivery has exceded the date originally fixed, the buyer will be able to signal the incident by written word (mail, fax, email) to catherine@teojasmin.com in order to improve the quality of service and allow Téo Jasmin to open an inquiry with the carrier. Such an inquiry with the carrier can last up to 21 working days. If the product is found during this interval, it will immediately be re-delivered to the delivery address indicated in the order form. If on the contrary the product is not found within the 21 days inquiry, Téo Jasmin will organize and pay for a new shipment of the products ordered by the buyer. Should the ordered product(s) be out of stock, the procedure detailed in article 8 will be implemented. In the case of an exchange of products, all delivery costs remain at the buyer's charge. In the event of a delivery that does not correspond to an order (damaged or not in compliance), the buyer must make his complain known within a 7 days delay starting from the day of the signature on the delivery slip. • contact details of the buyer. Sending back the producst must intervene within a 7 working days deadline starting from the attribution of a return number issued by Teo Jasmin's customer service. If these requirements should not be met, Téo Jasmin will not exchange or refund the ordered products. All products to exchange or refund will have to be returned to Téo Jasmin in his original state and packaging, and include the whole of the products and accessories. Shipping costs are at Téo Jasmin's expense, except in the case where the returned or exchanged product does not correspond to the original statement made by the buyer in his return form. The coverage of the return costs will be levelled out to the tariff corresponding to the La Poste shipment. The coverage will be in the form of a voucher to be used on www.teojasmin.com within three months following its issue. All risks regarding the return remain the buyer's responsibility. Should the procedure explained above and the indicated deadlines not be taken into account, the buyer will not be able to register any complaint for non-conformity or damage to the delivered products, these products hence being as per order. If an ordered product happens to be out of stock, Téo Jasmin will inform the buyer in the shortest delays. According to article L121.20.3 from the Code de la Consommation, Téo Jasmin can propose instead a product of equivalent quality and price. Freight costs will then be at Téo Jasmin's expense. If such an endeavour is not an option, the buyer will then be reimbursed immediately without delay and within 30 days of the sums he has paid. According to article 2014-344 from March 17, 2014 from the Code de la Consommation, the buyer can make use of a 14 days delay from the reception date, to return at his own expense the ordered products against reimbursement. Articles must be returned via registered means or any other way that features a shipping date, after having filled the form available to that extent on the website. Products must be returned to Téo Jasmin to ZI Actiloire - Rue du Clos Neuf - F45190 BEAUGENCY in a perfect state allowing reselling, in their original state (packaging, accessories, notice...), properly sealed and accompanied by the invoice issued upon purchase. If the product comprises a declaration of guarantee or any document to be filled upon purchase, these shall not be filled in order for the buyer to make use of his right to retraction. Any product returned incomplete, damaged, broken or with an impaired original packaging, will not be reimbursed or exchanged. WARNING : Canvases being printed upon order, and hence produced upon demand for the client, no return or reimbursement will be possible. - issuing of a voucher, under conditions detailed in article 10 below. Warning : shipping costs remain at the client's expense. Unless under special provisions detailed under article 9 above, all reimbursement at the expense of www.teojasmin.com will take the form of a voucher to be used on our website within 14 days following the execution of the right to retraction. By using this voucher, the buyer vows on his honor to not formulate any additional demande for complaint or opposition with his bank or other, to the transaction concerned by the reimbursement, and commits to not do so for a period of a year following the use of the voucher. The customer acknowledges that all breach to these obligations will expose him to the retrocession of the ill-received sum, in addition to damages Téo Jasmin could claim. Téo Jasmin retains the full and complete property over all products sold until final payment of the price, in full, costs and taxes included. All orders are verified twice before shipment. In the event of an error in quantities or damaged products, all complaints must be placed with Téo Jasmin within 48 hours following reception. No complaint will be accepted beyond that time. In the case of a justified complaint, we will replace the damaged article. All articles can be eligible for an exemple provided textiles have not been washed and canvases have not been taken out of their protective film. The exchange must intervene within 15 days after the reception date. The buyer will return at his expense the article for exchange and the shipping cost for the shipment of the new ordered article will be at Téo Jasmin's expense. The coverage of shipping costs by Téo Jasmin for reason of exchange is limited to once per client and per new order. If the new order is superior in amount, the buyer will accompany his demand for an exchange with a check for the amount of the difference. Address to use for all returns and exchanges : TEO JASMIN Atelier - ZI Actiloire - Rue du Clos Neuf - 45190 BEAUGENCY - France. Products sold by Téo Jasmin are subject to the applicable French law. Téo Jasmin cannot be held responsible in case of a rupture of contract due to out of stock products or product unavailibility, force majeure, disruption, total or partial strike including postal services, transportation and/or communications. Téo Jasmin cannot be held responsible for all indirect damages that could happen following the purchase of products. Téo Jasmin cannot be held responsible for all loss of data, files. It is the buyer's responsibility to save all the necessary information. The total or partial impossibility to use the products is not Téo Jasmin's responsibility, nore can it be used for damages or reimbursement. The www.teojasmin.com website also contains information from third parties, and links towards other websites. Téo Jasmin cannot be held responsible for damages resulting from the use of, the access to or impossibility to gain access to these third party information and content of these websites. If one or several stipulations from these sales terms become invalid as such following the application of a law, a settlement or following a final decision from an appropriate jurisdiction, all others maintain their effect and range. The fact for one of the parties to not take advantage of a breach upon the other party for any of the obligations mentioned in these sales terms, shall not be interpreted in the future as a waiver to the obligation concerned. Sales of products by the Téo Jasmin company are subject to French law. Information collected by Téo Jasmin during any order placed by the buyer are necessary for the management of the order by Téo Jasmin and their commercial partners. According to the data processing and freedom law 78-17 from January 6th, 1978, the buyer can make use of a right of access, rectification, opposition and suppression of data he is concerned with, with Téo Jasmin.